If there's one thing that really annoys me (and most people) about live shows, is queues - especially when they're long. Our group arrived at the venue a couple of minutes past doors, but found ourselves a couple of hundred meters away at the back of the queue. The turnout while expectedly staggering and apparently like the way it was almost 5 hours beforehand - was certainly a stark reminder of the popularity Bring Me The Horizon (and to a lesser but still significant degree, A Day To Remember) are now enjoying. The real shame though is that this was my first opportunity to catch August Burns Red, a band I have been looking forward to seeing for quite some time, but by the time we got in after nearly an hour and half - they had already finished their set. Fortunately I didn't have to wait long for the next to start. 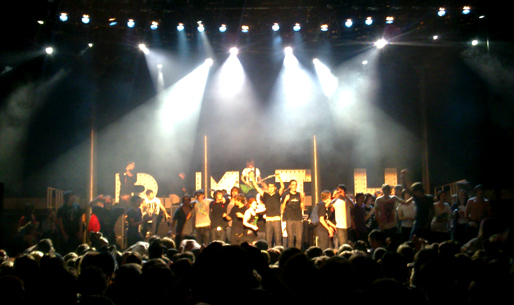 Once the lights dimmed, a familiar "duh duh duh duh, duh, duh, duh duh duh duh, duh..." sounded the start of "The Downfall Of Us All" - the first single from A Day To Remember's third full length outing "Homesick". And when the intro breakdown guitars tore through the air the crowd erupted in movement. The 2500 capacity Roundhouse was rammed to the brim and there was barely any room to move let alone see in front of you (though I am not the tallest of concert-goers) - but what I did see was bodies throwing themselves left right and centre - kids going wild with excitement pushing and shoving wildly. The band ran through most of their big numbers like "A Shot In The Dark" and "A Plot To Bomb The Panhandle" from previous record "For Those Who Have Heart", and "Mr. Highway's Thinking About the End" and "My Life for Hire" from "Homesick" as well as couple of other tracks on those albums. However the set was disappointingly short and was over before I knew it - only a handful of songs and nothing from the first album (I was anxiously waiting to hear "You Should Have Killed Me..." but was left disappointed). The sound was good for the most part and the songs were well received - the kids moshed to every breakdown, sang every chorus and screamed along to every line of lyric vocalist Jeremy McKinnon dished out. It was a good performance but I felt there was something missing (other than one of their best songs). Maybe it was a lack of international experience (after all, this is only their second time in Europe), or just a shyness about the band that stops them from letting themselves go on a stage perhaps too big for them at this time, but other than Jeremy, the rest of the band remained mostly static other than for some synchronised nodding, and didn't do that much to stir visual interest. It was a real shame because everything else about their show was good, albeit what you expect from a support act. I suspect things will definitely be a lot better when these guys headline their own show next time, and at a smaller more cosy venue. 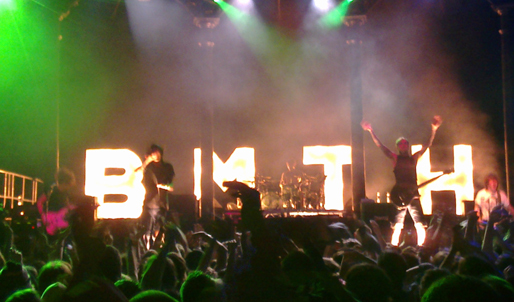 It is safe to say that any lack of memorable stage antics from A Day To Rememer was contrasted more apparent than any other when the headlining Bring Me The Horizon showed up. 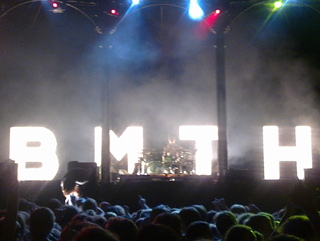 Drummer Matt Nicholls, stood behind his drum kit as he rose up on a small platform, high before a huge, bright, set of lights shaped to the letters "BMTH" to a frenzied audience screaming in anticipation for their scene idols. One by one each member of the band appeared on a separate stage area on various heights above the floor before finally the one and only Oli Sykes took to the centre stage, certainly a visually impressive entrance and already a lesson in professional presentation before the first song was even played (which was "Chelsea Smile"). Sykes' polarised reputation precedes him as one of the most prominent vocalists in heavy music - no one else can garner such extreme reception on both ends of the scale. You either love him or you hate him - but if there is one thing he can do well, it's that he really commands the crowd with confidence, exuding an air of authority that heightens his scathing vocal attack, heart-wrenchingly bitter yet disturbingly angry in delivery. Even with momentary lapses in breath, his showmanship was a class cut above most I've seen. The crowd violently flung itself into one other - a response whenever he called for it at the heaviest part of the songs. The rest of the band were no slouches on stage either. Guitarists Jona Weinhofen and Lee Malia rotated continuously and effortlessly around while Matt Kean took his bass guitar to pretty much every corner of the stage, and even managed a few jumps from the drum floor that was raised perilously above the floor. You couldn't take your eyes off their performance, it was so visually entertaining - even more so with the huge word-lighting that was just perfect for the show. Now while A Day To Remember had managed to sound quite decent - Bring Me The Horizon were noticeably louder and this caused huge distortions in the sound. The resulting acoustics in the venue were frankly terrible. I had difficulty making out a lot of what I was hearing, the exceptions being the breakdowns and the quieter moments which remained intact thankfully. In fact if it wasn't for Sykes' vocals and the drumming - I don't think I would have really known when one song ended and another started. The rest of the set list was identical to the show in Denmark that TL covered earlier. 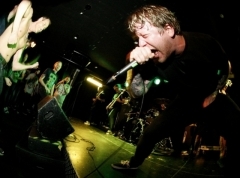 However what that show lacked and what this one made up for was Sam Carter of Architects personally making a guest appearance for the most excellent "The Sadness Will Never End", which he originally sang on - exchanging vocal lines with Oli Sykes side by side like brothers in arms. Short bits from the upcoming remix album (called Suicide Season: Cut Up) were played in between one of the songs and just before the encore for "Football Season Is Over". And again like the show in Denmark - Sykes asked the crowd to join him on stage just before the finale of that song. The other band members kept up a constant crescendo of repeating, droning noise while the understaffed security were trying to help audience members slowly and agonizingly over the barrier. One of my friends later told me that people were being crushed if they were at the front and didn't want to go (as he was at the front). What made matters hilariously worse was that as Oli was preparing to finish the show once he was surrounded on stage by a mob of fans - he had thrown his mic to the ground one too many times and indeed managed to break it. And he discovered to a stone quiet audience as he tried to scream that no one could hear him. He gave out a sigh and looked embarrassingly shy for a moment before somebody handed him another one - and the show finally came to an end much to his relief. An entertaining night ended with an equally entertaining (and slightly unusual) end that had managed to at least soften the disappointment of having missed out on August Burns Red earlier. The atmosphere was electric all throughout, and there was always lots of energy in their performance and the crowd was wild, but the poor sound really dampened what would have been something truly spectacular.